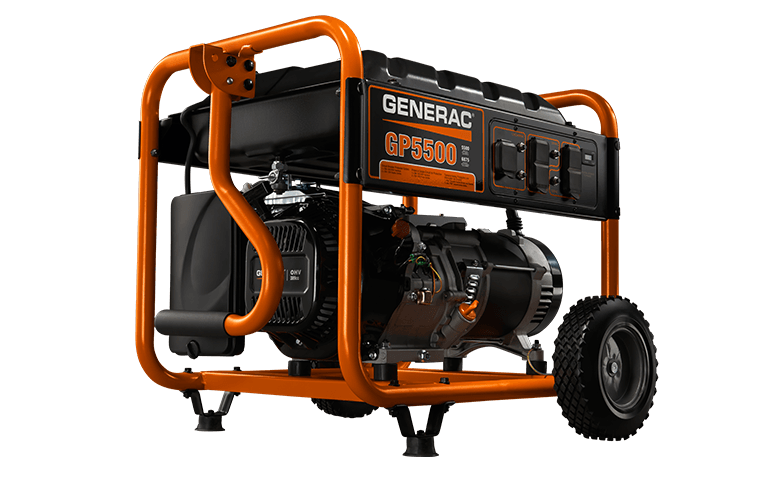 Rated 5 out of 5 by BMK1962 from Great value for the money During the Sandy storm we used our GP5500 to run a portable heater, 2 refrigerators a few lights, TV and cable box and an occasional hair dryer. We did have to alternate some of the appliances so that we did not overload the unit.We used a 30 amp cable with 4 outlets bought separately to run 4 appliances leaving the other GP5500 outlets unused. Overall we are very happy with the generator. We really used it for only the essentials and to keep informed on what was going on elsewhere in the northeast. I would suggest the 30 amp manual transfer switch kit to avoid the extension cords, that is my next investment! Rated 5 out of 5 by Jovanni from Perfect for home use. Very easy to use. The 5500 is compact and has plenty of power. Backup my house during Sandy for 7 days. 5 gallons of gas for 10 hours , 2 fridges , heating system, water heater, electric kettle and light. Rated 5 out of 5 by CC from Great value for what you get. This is the 1st I've owned. Sandy motivated the purchase. Had to go on a waiting list and Lowes came through on Sunday before. Wired it into the panel. Set-up was easy. It started right up. Had to use it for 24 hours after Sandy and 24 hours after the nor'easter (Andrea?). Powered the whole house with no problems. This generator has provided a long awaited peace of mind. Rated 5 out of 5 by Dave from Fantastic unit, Bought this days after hurricane Irene, didn't start it until the night of hurricane Sandy. Started right away after carb was primed. Was the envy of the neighborhood because I had prewired the house with a manual transfer switch so this generator became plug and play basically running my entire house. Can prob run a few window a/c units for summer outages if necessary. Worked well with very little effort. Rated 1 out of 5 by PowerlessUser from Engine runs great but doesn't generate power Purchased this unit on 2/21 from my local hardware store. Easy setup and unit fired up without a hitch. Ran for 18 hours during an outage without a hitch. Power restored only to go out again two days later. Unit again started without any problem. Ran all night. Got up next morning and realized that even though engine was running, no power was being generated. Called Generac and go literally no assistance. Checked all circuit breakers and did the field flash as Generac video instructed. No luck. Currently the unit has 26.2 hours on it. Took it back to retailer and was told to take it to local Generac service provider. Called first one and was informed that they quit servicing Generac about a year ago (probably need to be taken off the product website). Took unit to another area service agency and was told it will take 48 hours to diagnose. No power still and no generator. Unbelievably poor customer service from Generac and my retailer. Will post again once I hear from service company. GP5500 is rated 4.7 out of 5 by 752.